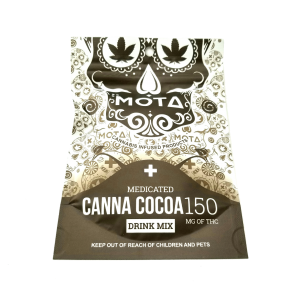 INGREDIENTS: CANNABIDIOL (CBD), TETRAHYDROCANNABINOL (THC), MILK CHOCOLATE (SUGAR, COCOA BUTTER, CHOCOLATE, NONFAT MILK, BUTTEROIL, LACTOSE, SOY LECITHIN, VANILLIN, SALT), PECANS, CORN SYRUP, SUGAR, PALM OIL, NONFAT MILK, BUTTEROIL, AND LESS THAN 1% OF SODIUM CASEINATE, SALT, NATURAL AND ARTIFICIAL FLAVORS, CARAMEL COLOR. 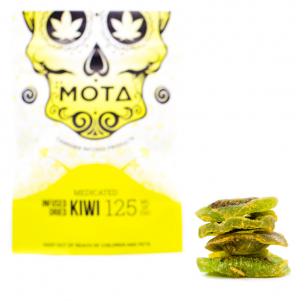 Our Medicated Dried Kiwi by Mota fruit is simple and tasty – a great snack infused with a perfectly extracted and measured dose of 125mg hybrid THC to kick any stress or anxiety throughout the day. Yoni Relax Cannabis Infused Tea by Mota is here for you ladies! 300 mg THC 100 mg CBD The organic mix of ingredients have been selectively chosen as a remedy for PMS and menstrual relief. With 20 servings per bag, there’s more than enough to last. Relax, enjoy, and feel the effects of nature’s cure. Dweebs Mota also known as Nerds, is the perfect snack with only 125 mg of THC per bag. They’re extremely delicious. Your childhood favourite.